Andrew Benintendi's one-out single in the bottom of the tenth inning off reliever Jonathan Holder drove pinch runner Tony Renda home with the winning run as the Red Sox came from behind to beat the Yankees 5-4 Sunday night at Fenway Park, completing a four-game sweep of New York. Trailing 4-1 in the bottom of the ninth, Yankees closer Aroldis Chapman walked the bases loaded and surrendered a two-out, two-RBI single to J.D. Martinez to bring the Red Sox to within one. The tying run scored on a throwing error by third baseman Miguel Andujar on a Xander Bogaerts ground ball. David Price started for Boston and pitched into the seventh inning and left with a 1-0 lead. Heath Hembree allowed two inherited runners to score and two more scored on an error by Bogaerts. Price gave up four hits and walked three while striking out five in the no-decision outing. Mookie Betts hit his 26th home run of the year in the bottom of the fifth off New York starting pitcher Masahiro Tanaka to give Boston a 1-0 lead. 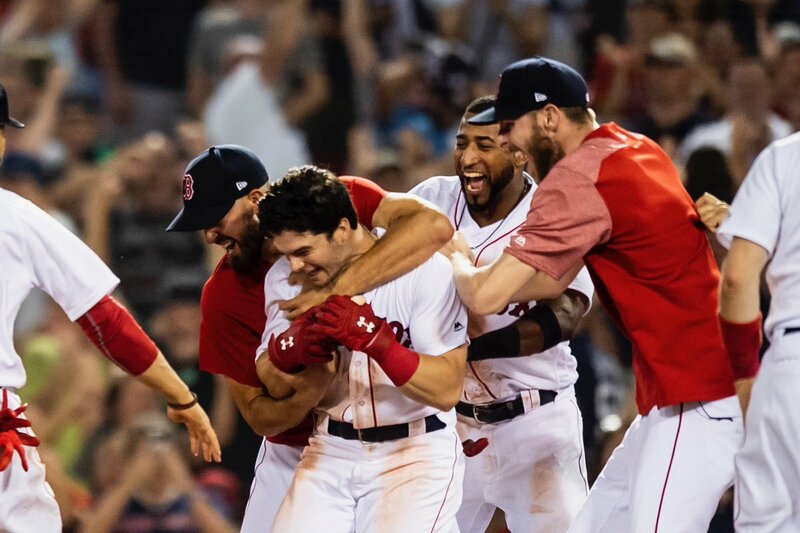 The Red Sox are 45 games over .500 and lead New York by 9.5 games (8 in the loss column) in the American League East.